Distinguished guests, beloved blessed families, and youth and student leaders from throughout Japan! I am honored to be with all of you today and to participate in this Global Youth Festival 2014, a youth rally to pioneer the future. I feel especially privileged to have been asked by my mother, Dr. Hak Ja Han Moon, to represent her today and to present, on her behalf, her keynote address. My mother asked me to convey her love and appreciation for all of you. You are the hope of the future. I ask you to listen carefully to my mother’s Founder’s Address. It contains deep and valuable content that can serve as a guide for this Global Youth Festival. 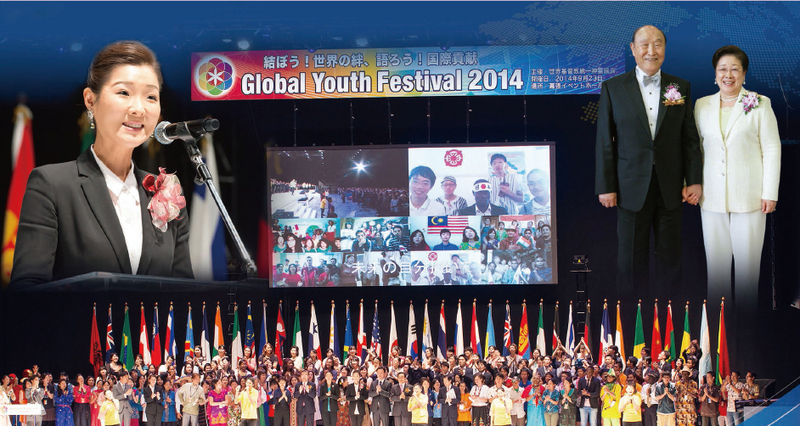 I sincerely congratulate you for hosting this Global Youth Festival 2014 here in Japan. Heaven’s providence has always advanced in a profound and mysterious manner through the unity of Korea and Japan. One good example of this was the 2002 World Cup that was co-hosted by the two nations. I also think it is significant that, as we gather here, the Asian Games, in which 45 nations and regions are participating, are being held in Incheon, Korea. If the Asian Games held in Incheon are regarded, in an external sense, as a sports festival in which young athletes participate for the harmony of Asia, then this Global Youth Festival in Japan can be considered, in a more internal sense, to be a peace festival in which young Japanese men and women participate for the sake of world peace. I sincerely hope that you young people of Japan become the leading figures who clean up the agonies, injustices and misunderstandings of the past, and bring harmony and cooperation between the peoples of Korea and Japan. In this way, you can also achieve harmony in Asia and peace in the world. Many people are suffering from the effects of climate change, environmental pollution, regional conflicts—and particularly from the confusion of values. My heart is deeply pained as I observe this reality. We must fundamentally change this deplorable situation and open a new era of peace. When the world falls into confusion and people the world over lose track of their true center, Heaven will call upon young people with a vision. When young people join together as one, opening their hearts to Heaven’s guidance and living for a higher purpose, they have opened pathways to peace, and launched great spiritual, moral and social revolutions. In this way the world can be transformed. When God inspired history’s prophets, he also called upon righteous people to follow His will. Among those he called, He first sought out young people. My husband, Rev. Sun Myung Moon, received Heaven’s calling at the age of sixteen and strove to discover God’s will. He read the Bible over and over again, such that its pages were dog-eared. He understood Heaven’s will and heart, prayed so hard that calluses formed on his knees, and wept bitterly over God’s sorrowful circumstances. When he studied at the Waseda College of Engineering here in Japan, he sincerely devoted himself to becoming a true person. He lived according to the personal motto that he must achieve mastery over himself before desiring to have mastery over the universe. Ultimately, the young Rev. Moon uncovered the deepest heavenly truths: God’s Purpose and Principle of Creation, the origin of sin and the human Fall, the path of restoration that humankind must walk in order to become the people God originally intended, and also the principles of development in the natural world as well as of human history. When I was just six years old, it was prophesized that I would become the bride of Heaven. At the age of seventeen, I married Reverend Moon. My husband and I dedicated our lives to establishing the models of true parents, true teachers and true owners. Centering on this vision, we spent every day of our lives educating people the world over. Even though the way to liberating God, bringing salvation to humanity and realizing a world of peace has been a road of thorns, we walked this path with grateful hearts. We did not permit ourselves to complain for even a moment. Looking back, my life can be compared to the ocean. The ocean has a broad enough bosom to embrace and become one with the heavens above, even coming to resemble its sky-blue color. The ocean lies at the lowest level, receiving all the waters of the world. The ocean embraces everything and gives birth to all life. Many kinds of life grow abundantly in the ocean. In response to the moon’s gravitational pull, there is the ebb and flow of the tides and the changes of the seasons. In response to the sun’s warmth, vapor forms on the surface of the ocean and the climate is regulated. A calm ocean may look peaceful on the surface. But deep beneath, vast currents, such as the Kuroshio Current [Black Tide], surge. In this way, the oceans are constantly in motion. When a huge wave breaks, it can swallow everything. Moreover, people cannot see the whirlpool forming deep beneath the ocean. These phenomena resemble Heaven’s providence and, at the same time, symbolize the dynamics of the life I have lived. Standing at the center of God’s providence, which raged like a storm, I have experienced so many deep and diverse situations I only know, but can never speak of. Suffice to say that, despite all the difficulties, I did not get sucked down into the whirlpools. Instead, by riding on and overcoming them, I was victorious and fulfilled the providence of restoration through indemnity, always standing alongside my husband, the Reverend Sun Myung Moon. The God that I encountered was a miserable, suffering God, whose omniscience and omnipotence have been constrained. Even though God created the spiritual and earthly worlds, due to the fall of the first human beings, God has never been able to call to us, “My son! My daughter!” Such a grieving God has been our father, our mother. Such is the heart of our Heavenly Parent. The excruciating pain of God’s heart is so intense that if you were to experience it fully, you blood would boil, your bones weep and your bone marrow would melt. Throughout history, God has carried in his heart this burden of pain and bitterness. When I speak of this, my heart feels as though it may explode. I have dedicated my life to liberate the painful heart of our Heavenly Parent and to open a new era of joy and peace, overflowing with love. Such an era has been opened on the foundation of True Parents having victoriously completed the providence of restoration through indemnity. On this foundation, our Heavenly Parent is looking for prepared, righteous people in order to pour out his love and grace upon them. Young leaders who have gathered here today! Will you become the leading people for such an undertaking? Just like the Kuroshio Current that moves the waters of the [western] Pacific Ocean, will you rise as young heroes who can move history? A youth movement centered on the teachings of this new truth was already born in Korea in 1954 and is celebrating its sixtieth anniversary. That movement in Japan is also celebrating its fifty-fifth anniversary. The young people who have come to know this new truth and who follow God’s will are playing a very active role at this time in history, going beyond Japan, Asia and out into the world. They are teaching and guiding people to love God, to love other people and to love one’s nation. Going beyond selfish individualism, they have dedicated themselves to a life of sacrifice and service. They are the leaders of the “pure love movement” and a moral awakening in a world plagued by promiscuity, sexual addictions and decadence. The social system, however, cannot change in a moment. Young people must take the lead the way. There is no time to delay. Your nation and the entire world need you take a stand; at this very moment, and from this very place. Let us all stand together. We can change this world, beginning with “me”, beginning with “us”. Now the world is calling for a true youth movement that opens up a new future. If you respond to Heaven’s call and fulfill your responsibilities, you will become heroes to be remembered in history; otherwise, you will be completely vanished from history. How can we achieve everlasting peace? We must recover our original nature and strengthen our conscience. As a result of the Fall of our first ancestors, humanity fell into ignorance and our original nature became concealed. The wall of ignorance continuously grew over six thousand biblical years and is now a high and thick wall. The river of our fallen nature has become wide and deep. It is difficult to climb over this wall or cross this river using human power alone. Our Heavenly Parent, who is the embodiment of true love, stands ever ready to help us. However, it is all up to us now. We must awaken, listen to and obey our conscience. The conscience is our second God, our second Heavenly Parent. If we are always spiritually awake, with Truth and the Holy Spirit dwelling within us, and we pray and live with gratitude for each circumstance of our lives, we will be able to hear our Heavenly Parent’s voice and experience the Love that can quake your whole body. Going one step further, all people must meet God’s representative. Human history has been the providence of restoration to establish one central figure. Two thousand years ago, God sent Jesus Christ, His only begotten son. But the leaders of his time ended up crucifying him because of their disbelief. Hence, the fulfillment of Heaven’s providence had to be prolonged until the time of the Second Advent. Finally, the Lord returned; he found Heaven’s bride, the only begotten daughter, and together they emerged as the True Parents. Humanity has ushered in such a blessed era. All people need to be able to meet our Heavenly Parent’s representatives, the True Parents. They should be able to attend and follow them. Only by doing so can humanity be rid of the original sin that has been passed down from one generation to the next, for over six thousand biblical years. Only by attending and following the True Parents can we be reborn as people filled with love and wisdom, which is the original ideal and standard envisioned by our Heavenly Parent at the time of creation..
People, who have brought mind and body into unity and who practice true love by serving, volunteering and contributing to society in accordance with the conscience can truly be called good men and women. If these people meet True Parents, receive the Holy Blessing based on true love, and form exemplary families, these families will become the cornerstone of peace. A true family is the nucleus of a peaceful world. When a true family is expanded, a new era of true nations and a true world opens up. My husband and I have put our lives on the line for the realization of peace. In 1991, my husband gave a speech that has become a legend. This speech was given at Mansudae Assembly Hall, North Korea’s National Assembly. His critique of the Juche Ideology and his statement that the two Koreas must unite through true love centered on our Heavenly Parent, , created shockwaves, especially since it was given in the very heart of North Korea, the Juche Kingdom. As he spoke, I felt as if North Korean security guards would come dashing toward us at any time. Those in our entourage broke out in a cold sweat. However, as the speech concluded we came to realize that this historical meeting with North Korean leader Kim Il Sung had opened a new door to the possibility of the reunification for the two Koreas. When following the path that leads to a peaceful world, we should confidently move forward even when we are required to risk our lives. There is a Russian embassy in Geneva, Switzerland. In 1985, when the communist realm was at the peak of its expansion, hundreds of people from the Professors World Peace Academy gathered at the Intercontinental Hotel, which in those days was right across the road from the Russian Embassy, and made a historic proclamation. According to my husband’s guidance, scholars at the conference proclaimed that communism would collapse within five years. They carried out Heaven’s plan despite the apparent dangers. A few years later, CARP students marched to the Berlin Wall in Germany, shouting out that the wall should disappear. They held onto the wall and shed many tears as they prayed to God for that outcome. They prayed for unity and for the fulfillment of the dream of one family under God. Those students came from many different countries; they were young people promoting the unification of Germany at the risk of their lives. Soon afterwards, an amazing event took place. The Berlin Wall collapsed. The collapse of the Eastern European communist bloc followed, and we witnessed the miraculous disintegration of the Soviet Union, where communism had originated. So the professors’ prophecy came true. Since the 1960s, we had carried out Victory over Communism activities in Korea and Japan. Responsible journalism played a central role in shaping public opinion through factual and objective reporting on the injustices of communism. Sekkai Nippo in Japan, The Washington Times in the United States, and Tiempos Del Mundo in South America, among others, stood righteously for truth and justice at this time. We inspired a movement for Victory over Communism in the democratic world, which provided great support in bringing an end to the Cold War. Even though there are many who contributed to this result, I believe Heaven was moved by the sacrifices and prayers of our young members who, at that time, risked their lives to carry forward this movement. I am sure that among those gathered here today are some who actually took part in those activities. I also know that there are young people here today who, even after the Cold War era, dedicated themselves to the movement for unification, justice and peace in different parts of the world. Often they were separated from their families and loved ones. They are the heroes and pride of history. Please give them a big round of applause. Ladies and Gentlemen, the path of living in accordance with the conscience and following the course of restoration through indemnity is difficult. The providence of restoration often requires that we go forward in faith and obedience. Those who do not know of the providence may persecute us, threaten us and even actually cause us physical harm. My husband and I, for the sake of Heaven Parents, have forgiven the unforgivable; and for the sake of humanity, loved the enemies unlovable. We also preached to unite beyond national borders for the sake of world peace. Then, what kind of lives must people lead to become leaders in a great revolutionary era? Yes, first we must lead a life of gratitude. Even though it is not easy to be grateful for everything at all times, but grateful heart brings unity of mind and body. When we empty out our hearts and repent, a life of gratitude can begin. We must always train ourselves to experience and remain awake to the fact that our Heavenly Parent is constantly with us, dwelling with us and sharing our joys and sufferings. Always be joyful; pray unceasingly. By so doing, those around you will find happiness, whether in the tiniest thing or in the greatest adventure. Second, we must live a life of forgiveness. When my husband was unjustly incarcerated at the prison at Danbury, he said not to pray for him but to pray for the United States. He invested all efforts to move the people of the United States, in order to save the world. As a result, many American leaders and Christian pastors took the lead in bringing about an end to the Cold War; later on, they also joined hands for the interreligious peace movement. When we forgive the sins of others as you would forgive yours, amazing blessings are given to us from Heaven. Third, we should live a life of love. True love is a love by which we continuously live for others, investing in others and forgetting that we have done so. Those people that live for their own sake may fare well in the beginning, but they will face decline in the end. This is the law of nature. We have invested more into the world than into our own church. For example, it was only after fifty years of our ministry that we erected a new headquarters building in Seoul, despite the dilapidated state of the Korean headquarters during that period. We are also aware of the serious financial difficulties facing blessed families. Be assured that Heaven will never forget your dedication and sacrifice to develop the providence. Fourth, we must live a life of unity. Our original minds and conscience, and our bodies and minds, must become one centered on Heaven’s true love. When parents and children live in harmony within the family, when nations live in harmony within the world, and when the spiritual world and physical world harmonize, then and only then can an eternal ideal world of peace come about. There is no unity where there is no center. It is easy for siblings to fight when parents are not present. This happens because the siblings do not fully appreciate or understand the parents’ desire and do not understand the parents’ deep heart. Only by establishing a connection of heart centered on true love can we understand our parents’ desire and heart. Only in this way can we become one in heart, one in body, one in mind, and one in harmony, with our parents. This occurs when our thoughts, emotions, words and actions are one. When this takes place, we can attend God in our lives as our Parent. When this happens, you and I won’t be separated people. We will instead become one family, brothers and sisters of the same lineage. Then, we can heal and bring an end to the numerous agonies and struggles within ourselves, and, at the same time, we can bring an end to wars between nations, which are actually brothers. Whenever I and my husband faced hardship, we did not evade them. No matter how unjust the persecution we received, we did not blame anyone; rather, we loved them. When we overcame ordeals in this manner, blessings that we could not even imagine took place. Within half a century, we built a foundation of international peace and mission work in 194 countries. We have laid the cornerstone for one world and one family under our Heavenly Parent. If we begin the peace movement on such a foundation, our lives, indeed all of history, will certainly change. Our moral culture will rapidly evolve. We will be able to expedite developments toward a world of peace, transcending religious and national barriers. We will be able to realize a life of joy and a world of peace, which is the desire of all people. Young leaders! Gratitude brings about heavenly fortune; forgiveness opens the hearts of people; and love moves people’s hearts. Let us all be grateful for everything, forgive our enemies, love our neighbors as one’s own flesh and work in oneness for peace. Young people of Japan! Let us all move to the wider world and take the lead in saving this world. Please bless this country of Japan. Please enable all those who have gathered here to attend you as their Parent, not just by intellect but from the bottom of their hearts. Let all those gathered here wear the armor of truth, see the world with eyes of wisdom, and, through love, to become leaders in achieving peace for the sake of their neighbors and all the world! Previous story Walking With God Every Day, All Day!